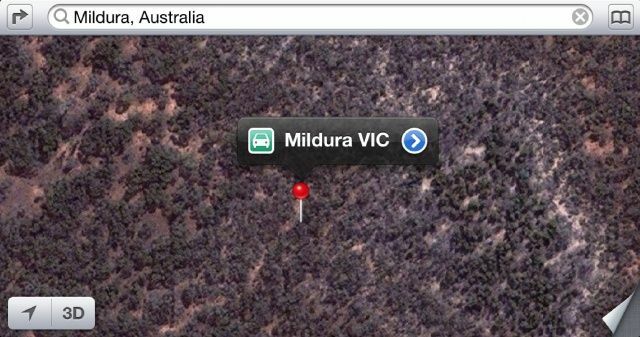 Apple’s Maps struck again this morning when it was reported that multiple drivers were being guided into the wilderness when searching for the city of Mildura. The local police deemed the glitch in Maps a “potentially life-threatnening issue” because the Australian wilderness is not exactly a safe place to get lost in. The temperature gets really hot and there’s no water. Since the fiasco started circulating in the media this morning, Apple has quietly fixed the inaccuracy in Maps and started pointing users in the correct direction. While Maps is still buggy in many other parts of the world, this particular example became a huge issue when a man was stranded for 24 hours in up to 46 degree Celsius temperatures. Several other drivers have been led off into Murray-Sunset National Park instead of Mildura. The park happens to be located more than 70 kilometers away from Mildura, and Apple has apparently just figured that out. Apple can silently update its iOS 6 mapping database in the background, and the company has presumably been using all of its user-submitted complaints to make Maps better. The people who got a nice tour of Australia’s second largest national park would probably say that Apple isn’t doing enough to get Maps up to snuff.